The Home Genie Paintathon Debrief! 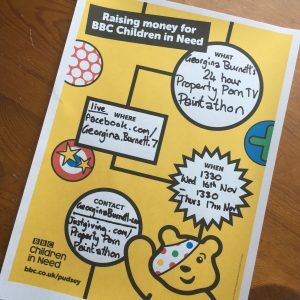 This is the post for my Children In Need Home Genie Paintathon Debrief. If you can’t see the video please click here. On 16th November I encouraged people to watch paint dry as I painted for 24 hours straight, whilst giving tips. The full period was live streamed on Facebook for all to see. This was partly so I could move people to sponsor me for Children In Need. It was also so that no one could suspect I didn’t stick to it… and so that I would stick to it! As someone who likes their sleep I knew it was going to be challenging. It was definitely worth it. Together we raised over £1800 for CIN. I’m thrilled to say that many of you have also since upcycled items you might have otherwise thrown away! 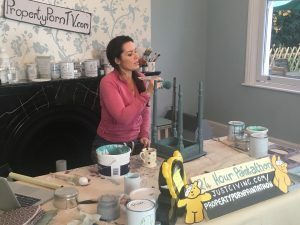 So this post is more of a thanks to all those who helped support the Home Genie Paintathon. There were many of you! I’d imagined that through the night I’d have a break from talking and would just be listening to the radio. Instead I was kept awake and motivated by viewers asking questions, telling me stories and quite often taking the mickey out of me – all much appreciated! In total I had 9000 views! I promised I would give details of all the paints I was using for those who want to give it a go. Hopefully you will choose more sociable hours! So thank you to all of you who kept me going and even more importantly pledged your hard-earned money. Thank you also to my mum and dad for being there for so many hours, propping me up whilst providing childcare. My husband also spent many hours setting up the technical side of things the week before. He then helped deal with the clean-up… oh and a tired and emotional wife! The suppliers who also donated so generously deserve a huge thank you. My first thanks goes to the very talented Elaine at Vintage Attic in Sevenoaks. For years she has been giving me her expert advice. For the Paintathon she also donated loads of equipment, paint and waxes, and introduced me to Milk Paint. 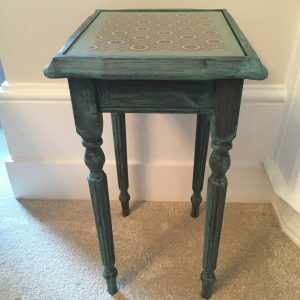 So I start with the Scandinavian style stool she donated for me to paint and then sold with proceeds going to CIN. I’ve never worked with Milk Paint before, but I completely fell in love. It’s so easy to use and has a stunning finish. It’s a powder you mix with warm water. 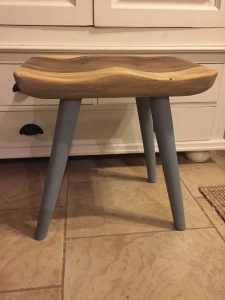 I painted the stool in Shutter Grey, the legs were solid with a ratio of 1:1 powder to water. The seat part was a more watered down version to give a contrast. I will be dedicating a video to Milk Paint in the new year so more details on the way. Elaine also runs workshops if you fancy a day in Sevenoaks. You may even end up learning alongside me in 2017! Elaine also introduced me to Autentico which is a beautiful chalk paint. I’m incredibly grateful to Dan there who donated a huge amount. This paint gives you a very professional finish. For this reason it suits the more accomplished painter. Definitely worth experimenting with as with some practice it achieves stunning results. It was actually the first time I’d used their wax and now I’m hooked. I love how it retains that lovely chalky finish while still protecting the paint. These were the items I painted with Autentico paints. This table was tran sformed with Graphite under Foggy Venice, finished with clear wax. 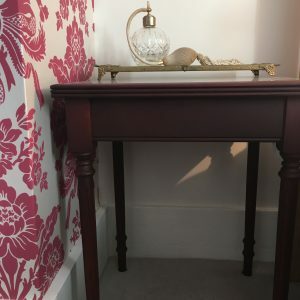 I wanted a rich wine colour for this table for which I used Grand Cru, with clear wax. 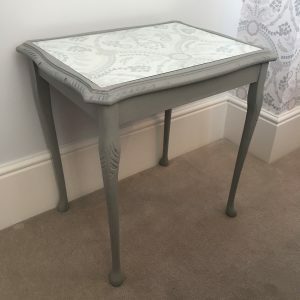 The Autentico Chalk Grey was used on a number of items like these and it looked particularly good with the grey wax as a finish. 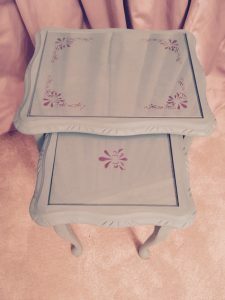 I used the milk paint for the darker grey on the top of these tables. Having scoured my house for things to paint, as the big day approached I started to fear I would have enough to fill the time! So I made a trip to my favourite second hand furniture shop, Abacus, Sevenoaks. Not only was I able to find the usual bargains with potential, but they also gave me some pieces to paint. They then auctioned these. As they are a West Kent housing Association enterprise it was great to be able to support their cause as well. I’m also very grateful to Sue at Dovetails Vintage in Sevenoaks who donated some Annie Sloan paint. 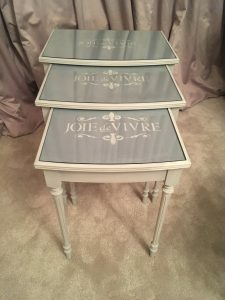 It always amazes me how far chalk paint will go! 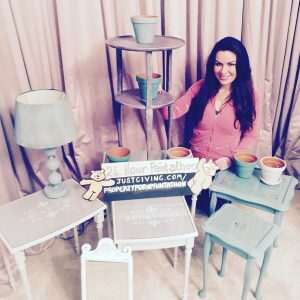 A tin of Provence, one of my favourite Annie Sloan colours, did the following items and more with plenty left over. 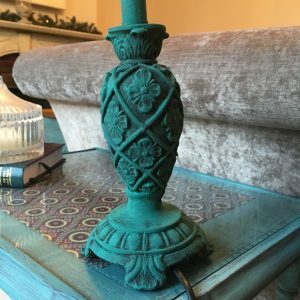 I also used Annie Sloan Graphite under Florence for this lamp and a piano stool which were particularly popular with viewers. I have to say I loved your enthusiasm. I haven’t listed everything here (as it would start to feel like another paintathon!) but do send any unanswered questions. Either email me georgina@georginaburnett.com or post on the comments section below. I must admit the whole drumming up of sponsorship became such a broken (but worthy!) record by the end of the 24 hours it was easy to forget the real reason behind the Home Genie Paintathon. I don’t know about you, but watching the coverage on Friday night brought it all flooding back to me. Yes I was tired, but I must admit I was in tears listening to the stories of these precious kiddies. Suddenly the back-ache and fatigue – plus the mess I still needed to clear up – were insignificant. Having taken me weeks to get over the sleep deprivation I’m not sure I would do the 24 hours again. It has, however, shown me the power of ‘doing your thing’ to raise money for a beautiful cause. So what shall we do next year guys?! Next year is a must Georgina… you Andy and everyone that helped need a big round of aplause. Well done to you all. exactly – it was a team effort! Thanks for the Milk paint and other links. I feel inspiration coming on. But yes, next year is a must, perhaps a 6 or 12hr event? I’d suggest a wineathon but think something more sensible would be better! Perhaps do a feature wall(s) in 1 of your rooms or perhaps an online house consultation auction?